When you purchase a new wig it always comes with extra length so that you can have it cut to fit your tastes, face shape and style. Before you purchase a wig you need to have an idea in mind of how you would like to be styled. If your natural hair was long before it started falling out, and you would like to replicate that style, you will need to purchase a wig with a length at least two inches longer than your desired cut in order to leave room for shaping. If you are more fond of shorter styles, buy a wig with at least one inch extra length. It is best to speak with a professional hair stylist or wig specialist prior to purchasing the wig and explain to him or her exactly what type of look you are hoping for. This way they can give you any extra guidelines you may need to ensure that the cut will possible. Once you have bought the correct length wig, your stylist can carry out the first cut and style. It is best if you are wearing the wig on your first visit. If you just send the wig out for trimming, it will be harder for the stylist to cut the hair in the most flattering way. Once the stylist sees the wig on your head and understands the look you are trying to achieve, they can determine the best cut for your face shape, lifestyle, and individual needs. Getting a cut that suits you involves more than just deciding on the length of the wig. You need to strive for a natural look, too. 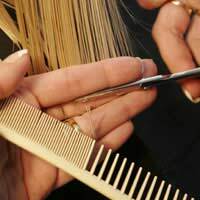 Along with choosing a stylist who can recommend the best cut for your face shape and wig type, you also need to think about what cuts will help the wig look most natural and which cuts will be easiest to maintain. Cuts with enough length, body, and movement to conceal the wig cap and hairline look most natural. Bangs, layers, or cuts with texture and wisps will also help conceal the edges of the wig and soften the hairline. Soft cuts that allow the hair to swing as you move will also look more natural than rigid cuts that are sprayed or styled into place. For ease of wear shorter cuts are the best option. Many short styles are flattering to all face shapes and since the wig starts out at a shorter length this also makes the initial wig purchase less expensive. Another advantage to choosing a shorter cut for your wig is easier care. Short styles are less likely to tangle, are easier to wash, and take less time to dry so you can start wearing them again quicker. No matter which type of wig (human hair or synthetic hair), what length of wig, or what face shape you have, a good stylist can cut it to suit you and give you the most flattering, most natural look possible. For advice on Where To Buy A Wig and Tips On How To Wear A Wig, read our articles in the Wig Help And Advice section on this site.